Note: You can find previous installments of this series by clicking here, Introduction, Part 1, Part 2. So in part 2 of this series, I finished making the backs for the four tenon saws that I’m currently making. Up to this point, the saw blades have been sized, the blue color has been removed, and the brass backs have been filed. However, nothing has been polished yet, the backs are still not attached to the blades, and the blades don’t yet have any teeth. These things are all better done after all of the construction work is completed because during the construction process, the blades, backs and handles will be assembled and disassembled multiple times. This would only serve to scratch up any polished metal, and if the teeth were cut into the blade, they would make handling the un-assembled blades less comfortable. So even though the blades and backs are not 100% completed yet, I choose to move on to the handles. I glue my paper patterns to a piece of card stock cut from an empty cereal box. This allows me to use one pattern multiple times. Every handle starts with a pattern. You can make your own pattern from a photo of an old handle, like I’m doing for three of the four saws I’m making, or you can look at sites like TGIAG Toolworks, where there are lots of handle patterns made available for your use. Once you have your pattern, either adhere it directly to the wood with some spray adhesive, like I did with the patterns at the top right of the photo above, or glue it to something a bit more rigid, like a piece of card stock. Using the card stock allows you to use one pattern for multiple saw handles and also makes it easier to align and trace the pattern on both sides of the stock, making truing of the saw cuts easier. Align the pattern so that you have straight grain going through the thinnest areas of the handle in order to prevent short grain runout at these weak areas. This will prevent the delicate details from breaking. After transferring the pattern to the wood, you can either go straight to cutting it out, or make your life easier by boring some holes first. As shown with the patterns in the top right of the photo above, a few strategically bored holes can really make sawing out the blank easier, and save you some work squaring up the saw cuts later. The hand screw clamp puts the handle blank at just the right height for shaping and allows the blank to be rotated around to the best filing position. It makes the job much easier than trying to do it in the bench vise. To cut out the handle blanks, I’ve used lots of different methods. 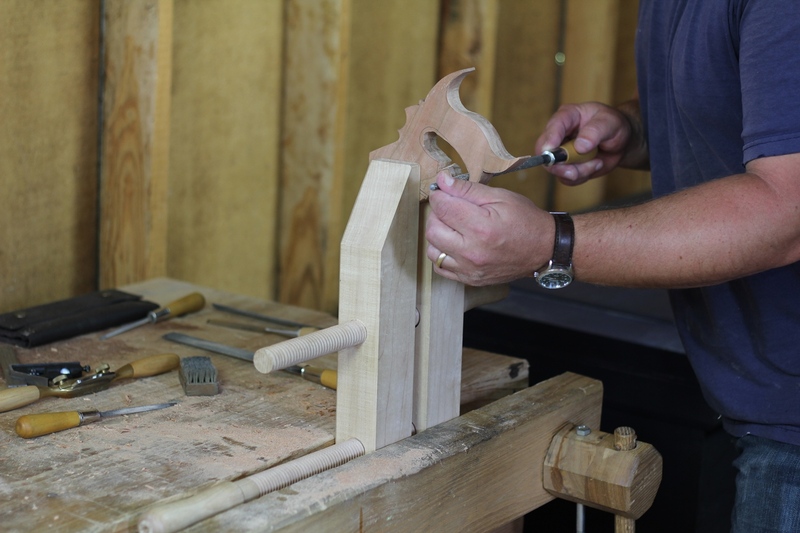 These days I typically use a 12″ turning saw, but I’ve used a coping saw, a jigsaw, a scroll saw, and a band saw. By far, the easiest is the bandsaw, at least for the outside of the handle blank. You might think a jigsaw would work well too, but I’ve found that the thin scrolling blades made for jigsaws tend to flex too much and you end up with cuts that are way out of square. This creates a lot of extra work with the rasp. Wider jigsaw blades just don’t work because the curves in a saw handle are just too tight. The 12″ turning saw and coping saw are actually faster than one might think. So lacking a bandsaw, that’s my chosen method. After cutting out the blank, it’s important to square up your saw cuts and work the blank down to the pattern lines. I use a variety of tools for truing up the blank and working it down to the lines. 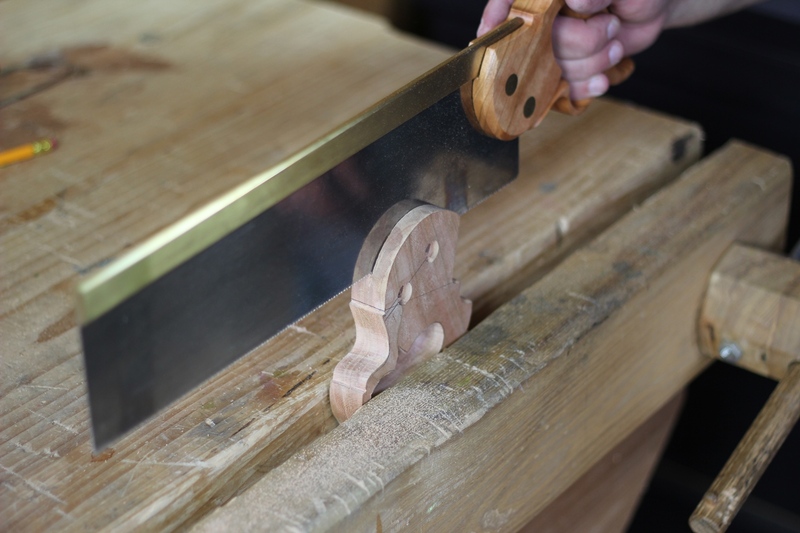 Depending upon how much stock needs to be removed to true up the saw cuts, I’ll grab anything from a chisel to a spokeshave, incannel gouge, rasp, file or card scraper. Small taper saw files are also useful for getting into tight areas in the pattern. You might think squaring up the sides of the saw cuts wouldn’t be a big deal since the handle will get so much additional shaping later. But I’ve found that this is probably the most important step in doing a professional looking job. By squaring everything up, you give yourself a good reference for laying out consistent lines to shape to on both sides of the handle. This ensures that your handle looks the same on both sides and that the curves you shape later will be more uniform and symmetric. While I may not use it often, I pull out my old bench top drill press for boring the handle holes. They need to be dead square to the face of the handle so that everything lines up in the finished saw. Once everything is squared up, I bore the holes for the split nut hardware. To do this, I pull out one of the last remaining relics of my power tool days. Most of the time I prefer to use a brace and bit or egg beater drill to bore holes. But these need to be perfectly square to the face of the handle. It’s certainly possible to do it by hand (the old saw handles were done that way), but I’m making these saws to sell, so I’m not leaving anything to chance. I start with a 1/16″ pilot hole. The pattern includes the location for the screws. 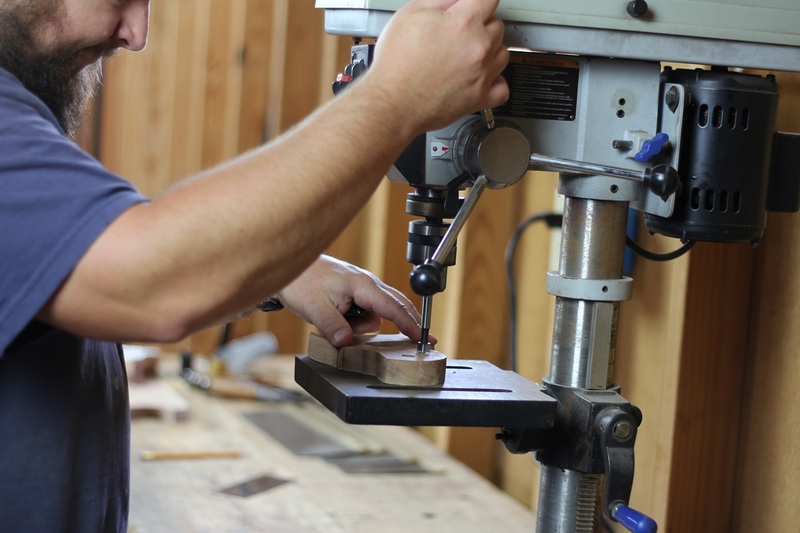 I make a starter with an awl, then use the drill press to bore all the way through. The 1/16″ bit will flex if you’re not careful, so you need to ensure that the hole is right beneath the center of the bit. I have a little trick for doing this. I hold the handle blank very loosely to the table. As I bring the bit into contact with the mark left by the awl, the bit will find the hole. If I hold the stock loose enough, the spinning bit will pull the handle blank into the correct position (the bit doesn’t want to flex). Once the handle has been pulled into position by the bit, I hold it firmly and slowly drill the 1/16″ pilot hole all the way through the stock. After I have the pilot hole all the way through, I switch to a 1/2″ Forstner bit to make the counterbore for the screw and split nut. I check the depth frequently by putting the head of the screw into the counterbore. You don’t want to go too deep here. If you do, the end result looks terrible. Just bore until the head of the screw fits to proper depth, or sits a hair proud. It’s easy to make the counterbore deeper later when doing the final assembly. Once the counterbores are drilled, I switch to an 11/64″ bit and drill the through hole for the screw shaft. It’s important to note here that you need to have your chosen hardware on hand before you start this process. Depending upon where you get your hardware, the dimensions may be slightly different than mine and require different size bits. Also, some hardware uses lock washers while other hardware, like the ones I typically use, have a square collar that needs to be mortised for. If you get the hardware with the square collar from TGIAG, complete all of the steps above and then excavate the screw side for the square collar that will prevent the screw from spinning as the hardware is tightened. If you get the style of hardware with the lock washer, you won’t need to make the square mortise. Take your time when sawing out the kerf for the blade. A mistake here likely can’t be repaired and will ruin a lot of hard work. 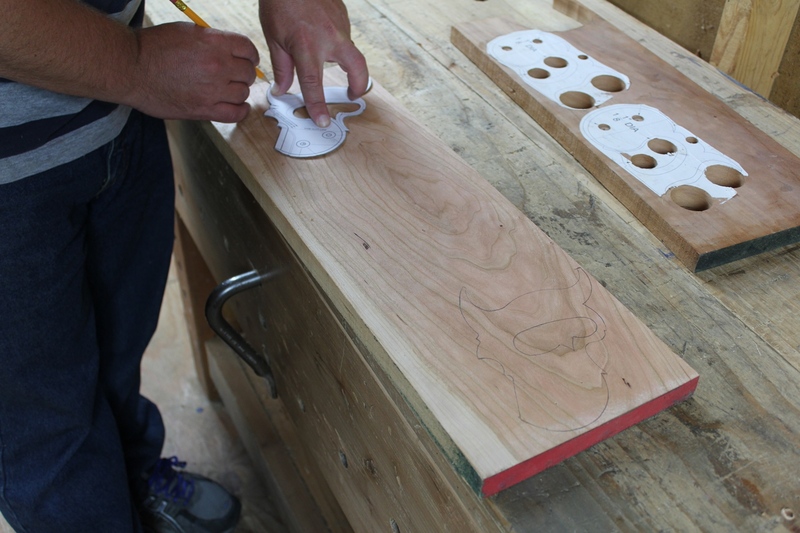 Once the holes for the mounting hardware are bored, you’re ready to saw the kerf. This is probably the most nerve racking part of the entire build. You need to take your time and get this right the first time. If your saw cut is off, the blade will not sit in line with the handle and you will struggle to cut straight with the saw. If you try to fix this problem by making a wider kerf, the handle fit will be sloppy and the end result looks shoddy. To mark the location for the kerf, I use a marking gauge and scribe from both faces of the handle. This ensures that the scribe line is centered on the blank. I also use a pencil and a square to clearly mark the depth of cut on both sides and both edges of the handle blank. I watch this line meticulously so that I do not end up sawing into a detail that I don’t want to saw into, like the lamb’s tongue at the bottom of the handle. I also make sure I’m using a saw with a blade that is not thicker than the blade I’m making so that the resulting kerf is a snug fit. 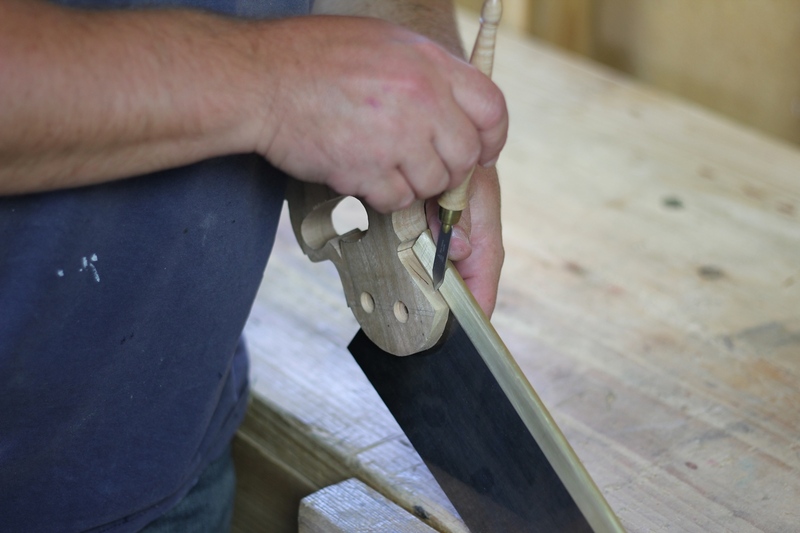 The handle should slide on easily, but stay in place by friction if you get the kerf right. There should be no slop. The brass back needs to be inlet into the top of the handle. I mark this mortise directly from the back for a nice snug fit. Once the blade fits properly and to the correct depth, I put the back on the blade and reinsert it into the handle. The brass back needs to be inlet into the top of the handle. To do so, a mortise that is exactly the width of the brass back needs to be chiseled into the handle. You could try to measure this, but I prefer to mark directly from the back itself. This ensures that the mortise is in exactly the right location and ensures that the back fits in snugly, without any slop. To mark the depth, I move the back forward on the blade and drop it down the front of the handle until it is sitting at the depth that I want. Then I can mark the depth directly from the back as well. It usually takes a few dry fits and adjustments before everything is just right. But it’s much easier to make adjustments now than it is once the back is glued on. Making the mortise is basic chisel work. Watch your width and depth lines and just don’t chisel past them and everything should work out just fine. If the mortise is undercut slightly, that’s OK. The undercut won’t be seen underneath the back. But try not to undercut too much or you could end up with a sloppy fit or a weak handle. Once the mortise is cut, I do one last dry fit, and make any necessary adjustments to the mortise or the blade itself. Sometimes, you need to file the rear edge of the blade (the part inside the handle) just slightly to get everything to fit into the handle just right. At this point, we’re home free. All that’s left to do now is final handle shaping, finishing and assembly. Posted in Hand Saws, Project Logs, Toolmaking and tagged sash saw, tenon saw. When I built my first (and only handle) I was nervous about getting the slot just right. So I milled up a piece of wood to just under half the thickness of the handle (minus half the thickness of the saw blade) and laid my blade onto that piece. 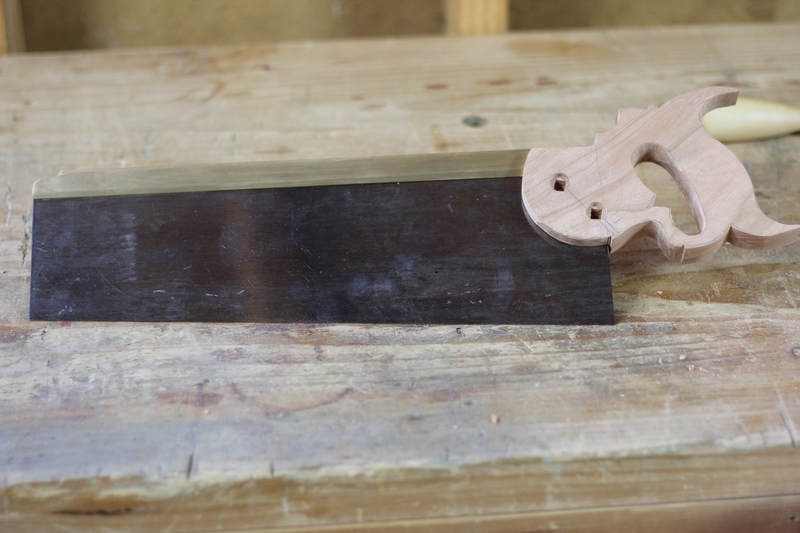 I slotted the handle horizontally by placing both the handle and the blade-plus-spacer-block flat on the workbench and sliding the saw back and forth against the handle. I can’t remember where I saw that technique. It goes quite a bit more slowly, but it makes it less likely to ruin your handle, I think. Have you ever done it that way? I have not used that technique, but have seen it before. As you said, it works great. It’s just slower.